We love books in our house and we have so many children's books so when I saw that there was a Children's Book Festival taking place in Manchester this weekend, I knew it would be a great thing for us to go to. After driving in ever decreasing circles trying to find the right university and car park in Manchester, we arrived at the Festival and got a programme to work out a plan. 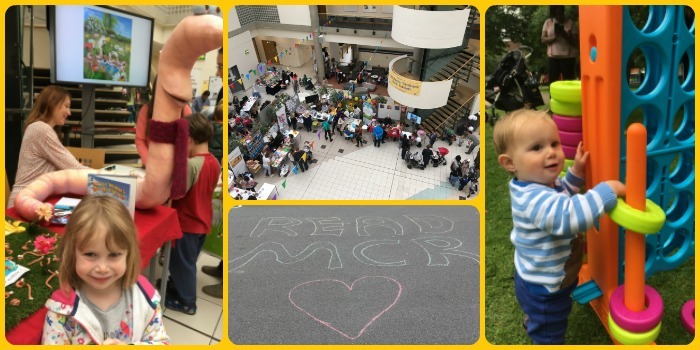 The fun day was spread across different Zones at the Manchester Metropolitan University. One of the nice volunteers took us over to the Family Arts Network Zone where the activities were taking place that were aimed more at Little Miss A's age group. The room was filled with arts and craft activities for all sorts of things so Little Miss A got involved with a couple. Then we decided to go to a reading of 'Masha & The Bear'. It's not a story I am familiar with but it was a really lovely reading of this old Russian folk story as there were musicians playing authentic Russian instruments - balalaikas and domras. From here we visited a few more stalls including meeting 'Little Worm'. Little Miss A made a plasticine worm to add to the collection. 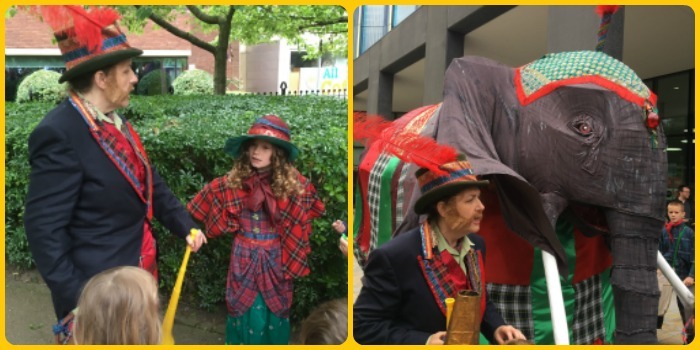 We then headed outside for a wander and were just in time to join in an Elephant hunt for Maharajah the Elephant from the book by Jane Kerr - The Elephant Thief. Characters brought this hunt to life and it was really fun. When asked for her favourite thing, Little Miss A says 'the elephant hunt'. We were successful in finding Maharajah who was beautifully made and decorated. On the hunt we had passed some inflatables so Little Miss A really wanted to go on these. There were also lots of games scattered around and Baby R really enjoyed the Connect 4 rings! We paused for a few of our sandwiches and then I treated Little Miss A to an ice-cream (our only expense for the whole day as all the activities were free!). We also managed to catch Peppa Pig who was making appearances throughout the day. 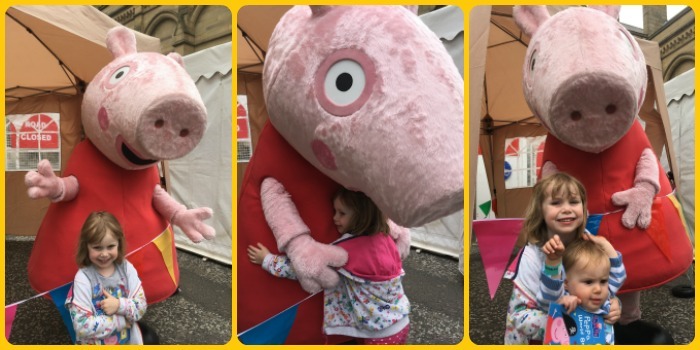 Little Miss A loves meeting characters and Peppa was no exception! It was then time to head back to the Family Arts Network Zone to go on another hunt, this time for a bear. A series of rooms had been set up as the different scenes from 'We're Going on a Bear Hunt'. It was good fun. Our last activity was to make designer football with the National Football Museum. Who knew you could make a ball with a balloon, a nappy sack, string and lots of paper!! At this point I was absolutely shattered so it was time to go home. Luckily Little Miss A was happy to go. Baby R fell asleep before we even left the car park! There were lots of workshops and book readings that we didn't go to. Plus a whole Zone we didn't do at all as it was aimed at older children and teens. However, we packed as much as I could manage in as it was just me on my own with the kids. Some of the events were ticketed with tickets bookable before the day. The tickets were free so I think people just booked them and then didn't show up as we managed get in without tickets. 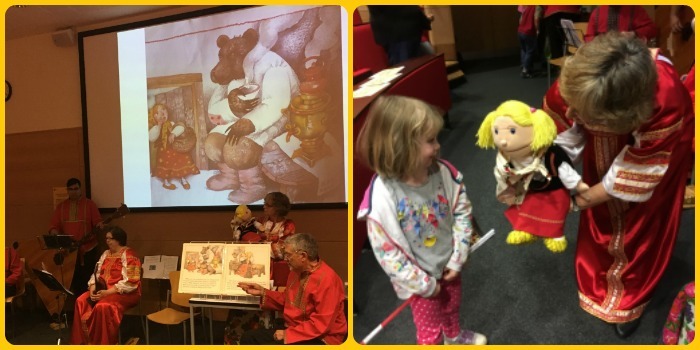 The reading of Masha & The Bear was supposedly a sell-out from pre-booked tickets but the room was practically empty which was such a shame for the musicians. This was a really fantastic family fun day. Mr MoaB couldn't believe that it was all free when I described what we'd been up to. I'm definitely putting next year's date (24th March) in my diary!